As laptops become increasingly powerful, more people are incorporating them into their home or office workspace. With an external monitor, anyone can create a pseudo-desktop environment and enjoy the benefits associated with a larger display. If you’ve built a setup like this before, you’ll no doubt be aware of its shortcomings. When you need to take your notebook on the road, all of its ports need to be liberated. It’s a time-consuming, clumsy process and often leads to numerous cables falling down the back of your desk. Elgato’s Thunderbolt Dock acts an intermediary for your MacBoook or Ultrabook, offering a wealth of ports to keep your workspace tidy. All of your cables and external hardware are attached to the dock, while your laptop is connected with a single Thunderbolt cable. When you need to head out, that single lead should be simple to detach, leaving the rest of your setup undisturbed. Sublime in theory, but what about in practise? 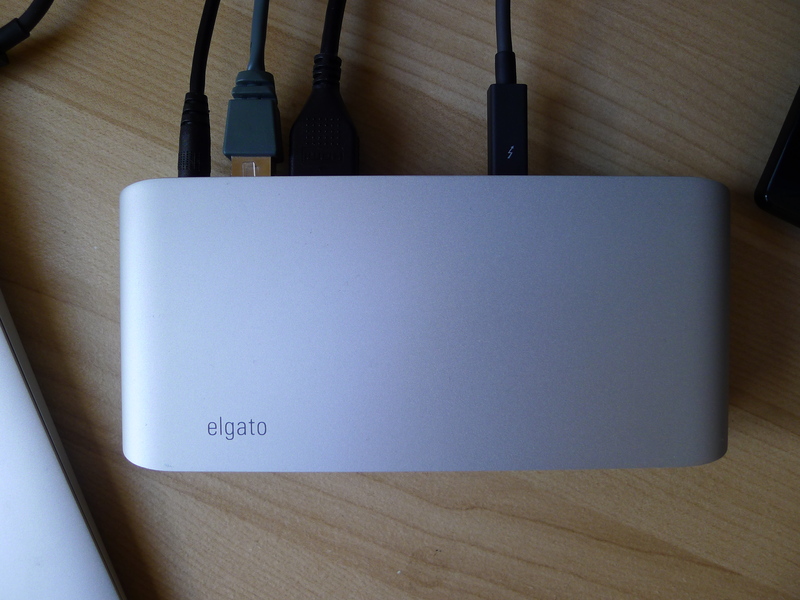 Elgato’s Thunderbolt Dock is a small, plastic box wrapped in a smooth aluminium shell. The material and finish are almost identical to the casing found on the MacBook Air and MacBook Pro; no accident, given these are the most common Thunderbolt-compatible devices at the moment. It’s an unassuming piece of hardware, which Elgato has clearly engineered to quietly fade into the background. While its rounded edges and considered design give it a premium feel, the Thunderbolt Dock is unlikely to attract the attention of your colleagues, family or housemates. Once you’ve filled the ports and pushed it to the back of your desk, you’ll probably forget it’s even there. It’s lightweight too. At 260 grams the Thunderbolt Dock is perfect for quickly stowing in a backpack or satchel, while retaining enough heft to not be pulled around by anything on your desk. The device is 7-inches long and a little over 3-inches wide, which is just small enough to make it feel unobtrusive. All of the ports work without a hitch. Elgato gives you a free Thunderbolt cable in the box, so within seconds you can have a MacBook or Ultrabook properly connected. External displays can run through the single HDMI port on the back, with support for up to 2560×1600 resolution. On the rear, you’ll find a Gigabit Ethernet port, two USB 3.0 ports and another Thunderbolt port which – just like your notebook would normally – means there’s always one free for supported peripherals and displays. Elgato’s Thunderbolt Dock requires its own power supply and, as a consequence, adds yet another cable to what could be a hive of wires at the back of your desk. Nevertheless, with a few cable ties you can reclaim some order and it’s certainly tidier than having them all connected to your laptop. Given its independent power source, the USB 3.0 ports can also be used to charge other devices, including smartphones and tablets. 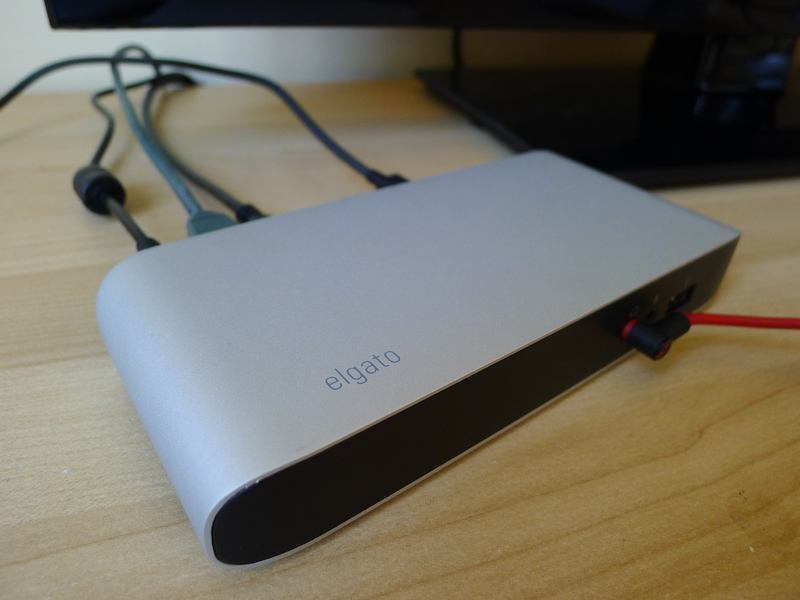 If you already have a kickstand or makeshift charging cradle lying around for these, Elgato’s Thunderbolt Dock is a handy conduit to have resting on your desk. The ports on the rear-side are for the fundamentals of your workspace and, as a result, you’ll rarely need to reach around and adjust them. 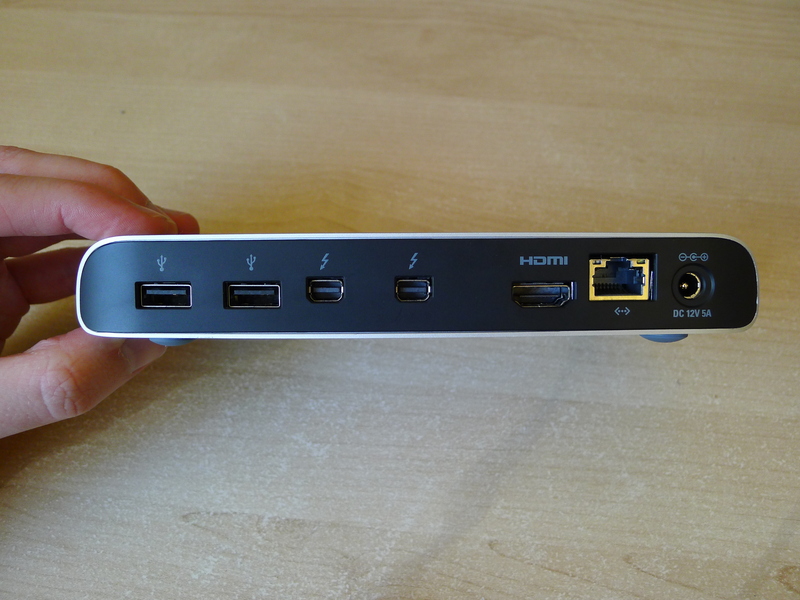 On the front, meanwhile, is an additional USB 3.0 port, a 3.5mm microphone input and 3.5mm audio output. These are well-positioned and built to take some abuse; whether you’re throwing in headphones, a thumb drive, or an external microphone, the Thunderbolt Dock never skips a beat. Admittedly, this device is a luxury. Even if you’re using a MacBook Air or an older MacBook Pro, it’s simple enough to buy a Mini DisplayPort to HDMI adapter and hook up an external monitor. Repeatedly detaching cables can be tiresome, but it’s still a viable option for anyone with swathes of patience. What the Thunderbolt Dock offers is simplicity and ease of use. The initial set up might take a little while, but once you’ve finished the long-term benefits are fantastic. For instance, with Elgato’s aluminium box my MacBook Air now has a wired network connection for the first time, as well as a dedicated HDMI port. There are extra USB ports to work with and at any point I can easily detach my headphones and external microphone. Bliss. Of course, the dock’s biggest advantage is that your workstation is left undisturbed when you need to quickly grab your laptop and bolt out the door. In those crucial moments, the time it takes to decouple your MacBook or Ultrabook – just detach the Thunderbolt cable and you’re ready to go – makes such a workspace setup increasingly attractive and viable. For $229.95 though, the Thunderbolt Dock is pretty expensive. I suspect its price-tag alone will be enough to deter most people, but if you really care about connectivity this is a well-designed and stress-free solution. If you’re using an external monitor in conjunction with a Thunderbolt-compatible laptop – or thinking about doing so – this is easy to recommend.